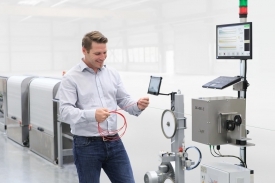 At this year's Wire Dusseldorf Rosendahl presented their innovative color-recognition sensor system for insulation lines. The DVS SK 400-C impresses with its easy operation and stable production results. Color complaints and faulty productions are now a thing of the past. This color-recognition sensor system is a novel sensor for additional color monitoring in insulation systems. The main component is the PC-based evaluation unit with 360¬∞ camera surveillance. The precise sensor unit of the system consists of 4 cameras and is protected by a protective housing made of high-quality stainless steel. The interior is sealed off from extraneous light. This gives the manufacturer stable and reproducible results. The evaluation algorithm is based on the "LAB color space". It is used in color measurement worldwide because it is very similar to human color perception. The main and stripe colors, as well as the stripe width, are measured according to previously set references. Color deviations are detected immediately. This enables reproducible and constant production. Scrap and waste are significantly reduced, both at the start of the production and during a color change. This not only helps to save costs, but also pleases the manufacturer. Additional production steps, such as printing, are easy to integrate because the sensor is completely insensitive to water and rotation. With a maximum line speed of up to 2500 m / min, this sensor system is also suitable for high-speed applications. The system saves space and can be integrated as a stand-alone unit in new or existing systems.